Through Life Physiotherapy provide therapy for adults and children who have NDIS funding. Through Life Physiotherapy is a registered NDIS provider of Physiotherapy. We were the first physiotherapists in the Gippsland Region to be registered with the NDIS. Our first NDIS participant patient started in March 2017 (on early roll out). Since then we have worked regularly with more than 50 adults and children who live with a disability. Through Life Physiotherapy specifically employ physiotherapists who have additional training in Paediatric and Neurological Physiotherapy so we are highly skilled in working with people who have a disability. Individual appointments in our accessible clinic with easy off-street parking. Body and Brain Rehab sessions in our clinic. Home visits for assessments, treatments and carer training. Workplace visits to enable to you participate in employment. Visits to Daycare, Kindergarten or School to provide therapy in that context and to train educators and aids to ensure therapy happens everyday. Hydrotherapy and Aquatic Physiotherapy at your local pool. Visits to adult day facilities so that your day is not disrupted by needing to travel to therapy. Visits to dance classes, sports training or sports events for assessment of your ability in your chosen recreational pursuits, Physiotherapist can then develop training specific to enhancing your skills in that sport/dance style and coach your coach to enable to you run better, improve your ball skills or dance with better technique. Gym visits to set you up with a program of exercises that are fun and beneficial. We can train a carer to help you follow the gym program if that is helpful for you. 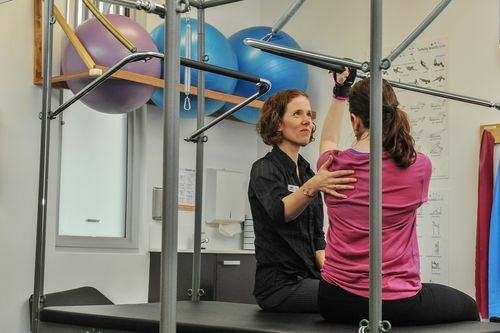 If you don't have an NDIS plan yet or if you are about to have your plan reviewed you may like to come and meet one of our therapists to find out what Through Life Physio can do for you. You are welcome to book a free 15 minute NDIS meet and greet appointment. We don't do any formal assessment at that time, but we can discuss how much and what types of/locations for physiotherapy you may want. We will write you a brief letter that you can take to your NDIS planner stating how much physiotherapy you would like included in your plan and why. Learn from you what your goals, hopes and dreams are. Discuss with you how much and what sort of physiotherapy you would like during your current funding year and ensure that this fits your plan budget. Complete a NDIS Service Agreement so that you have clear documentation of what we are commiting to provide for you. It is really helpful if you can bring your NDIS plan documentation with you to your first appointment so that we have a thorough understanding of your goals and plan.